Today’s article is two-fold. First, we’re going to look at resolutions from Walt Disney World Cast Members in 1983. These offer some terrific insight into the mindset of Cast Members, as well as the era in which they formed their resolutions. We’re also going to pull together the roundtable for one last hurrah in 2009, but this time (via Facebook, Twitter, and email) we’ve opened up the discussion to any and all who wanted their 2010 Disney Resolution to be known. So, ponder over the question, read some other’s resolutions, and then leave us a comment with your 2010 Disney Resolution. 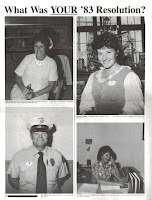 The Cast Members of 1983 had a lot on their mind, health, transportation, even marriage! The humor and good spirit that we all know and love as a part of the interaction with Cast Members shines through, even in their own publication. These resolutions come from the January 13, 1983 Eyes & Ears, and for each page we’ll move clockwise through the resolutions, starting in the top left corner. Dale Enman from First Aid plans to give up soap operas because “…the make me depressed.” She adds jokingly that she vows to lose 85 pounds this year! Randy Reardon, a Residential Host at Lake Buena Vista, plans to enjoy himself and make a lot of new friends. Randy Cueller, a locksmith, is planning to buy a new car… an Alfa. Isabel Minier, a Sales Hostess on Main Street, wants to become a millionaire. She says she would also like to become a stronger person in the new year. Several of the workers from the Stage Door Café in The Center made “weight watchers” New Year’s Resolutions. Bonnie French is going to “eat nothing but diet food.” Deloris Ginn says, “I’m going to lose 50 pounds and look just like Diana Ross.” Dorthy Fryer plans to lose 25 pounds. “I don’t make resolutions, I just break them!” says Pam Lue Pann, a PBX Operator. Now, on to this year’s resolutions! Roundtable Topic: What is your Disney Resolution? Roundtable Guests: Matthew Sedlar (The geekTicket), Elizabeth Caran (Take the Monorail), Trace Jennings (Disney Dudes Podcast), Greg Grimsley (The Disney Obsession), Eric Hoffman (Netmongrel), April Baker (Scrapping the Magic/Take the Monorail), Mary Jo Collins (In Disney Style), Tony and myself. Trace – [My Disney Resolution is] to run the WDW and Disneyland half marathons in 2010. Greg – Resolutions. I am resolved to not make resolutions in 2010. Okay, that isn’t really my resolution. I do have a few and here they are. 1) I am resolved to be more consistent in writing and posting to my blog. Let’s face it, 57 posts in a year is pretty lame. But to be more consistent will mean adding some non-Disney content. I hope my readers don’t mind. 2) I am resolved to lose a minimum of 2 pounds per month and perhaps partake in a little exercise. 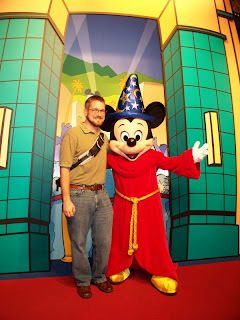 At my age I can’t hope to develop a six-pack, but maybe I can look a little better for the WDW Cruise in February 2011. 3) I am resolved to perhaps get back on a podcast – someday, somewhere, somehow. 4) I am resolved to begin reading The Everyman’s Library “Essential 100”. 5) I am resolved to visit the parks with a certain friend from western North Carolina. Matthew – My resolution is to finish the Walt Disney World Marathon in less than five hours. I'm aiming for four and a half, but I don't want to set the bar too high. Also, I want to attend the next D23 Expo. 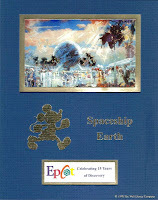 Eric – Resolving to launch and take my online Disney ventures to the next level (anything's higher than level 0) in 2010. Elizabeth – My goal... the half marathon… I cannot possibly justify going if I cannot complete my share of the race, right?! Mary Jo – [My Disney Resolution is] to not give them so much of my money. April – In 2010 I'm going to look to simplify things. Life is too complicated to have complicated systems in place. And I'd like to take Scrapping the Magic to the next level... whenever I figure out what the next level is. As for a Disney themed resolution I'm going to make it a point of doing every one of my WDW to do. See every show, do every event, see all the parades. And I plan to photograph Fantasyland & Toontown from top to bottom so I won't have any regrets over missed pictures when they start to do the rehab. Tony – My 2010 resolutions are going to bring both the good and the bad to my Disney "lifestyle". While the harsh reality of some of my Non-Disney resolutions will be keeping away from the parks as often as I have grown accustomed to visiting, i.e. completing work around our home etc., I will "upping the ante" in other aspects of my "lifestyle" through a greater focus on enjoying the community outside of the parks. While 2009 was a trying year for my family, it did bring us an amazing group of new found friends, through the Disney Online community. True friends, with whom we spend time outside of any aspect of Disney and offer real friendship and support in all aspects of our lives. Had you told me a year or so ago, that I would have forged such bonds via the internet and meets at theme parks, I would have told you were, quite simply, insane. Yet here we are, on the cusp of a new year and I am surrounded by an incredible group of friends, on whom I can truly count on. In this New Year, I resolve to strengthen these bonds with continued fun and friendship and vow to keep myself open to meeting new friends and creating new experiences together along the way. On a less "spiritual" level, I look forward to working on some of the other fun Disney based projects that I have grow to enjoy being part of and will strive to see that they are as relevant and enjoyable to myself and others as the friendships which have brought these projects to me. I wish both new friends and old, a very Happy and Prosperous New Year!!! Ryan – I am resolving to complete more projects and further spread the roots of the Main Street Gazette, roots that have been created by hard work and a wonderful readership. I am also resolving to take my own advice to occasionally stop, take pause, and enjoy time with my friends when I am at Walt Disney World. On October 28th, a guy who is super passionate about wine and a social media guru released a video of a wine tasting done during the 2009 Epcot International Food and Wine Festival. In case you haven’t already figured it out, I am talking about Gary Vaynerchuk and his show Wine Library TV. As it so happens, I was able to participate in this tasting and filming when it was done back on September 25th. You can see the finished product below. The tasting focused on grape varietals from Portugal that are rarely sought after by the average American wine consumer. The three red wines offered something for everyone, and Gary did a fantastic job facilitating the filming of the Wine Library TV episode and discussion afterwards, despite the circumstances. Those circumstances included sitting down at tables with black tablecloths, in the direct sun of Florida that was hanging over the cape of the Italy pavilion, with no shade for approximately an hour and a half. Anyone who knows anything about wine knows that while the environment and temperature that you are in when you partake in a wine isn’t everything, it certainly contributes to the overall taste and flavors one experiences. In order to give the wines a fair taste, I attempted to find the same wines and taste them for a second time in the comfort of my own home. Unfortunately, no wine shops in the area had the wines, or even saw them as available in North Carolina. With a little digging online, however, most of the wines can be found. Below are the wines and my notes for each. 2006 Quinta Do Cabriz – The first thing I smelled with this wine was cherry and something spicy, the tang of which was similar to sour candies. In the background, I could almost smell some sweet flowers. When it comes to taste, this wine is a bit of a shock. That cherry is still there, as is the twinge of sour, but the wine is also very smooth, leaving an aftertaste that reminds me of something creamy. The only comparison I have for the feeling this wine leaves in my mouth, the feeling not the taste, is that of a well-crafted hot chocolate. This was, by far, my favorite wine of the tasting. 2006 Monte Del Cal Red – The smell of this wine was all steakhouse. It scent betrayed a spicy, peppery, meaty aroma that actually caused my nasal passage to spasm. The taste of this medium-to-full bodied wine was bitter and had aspects of deep dark berries and very dark dark chocolate. I am not a fan of dark chocolate, and therefore found this to be the least appealing of the wines. However, for those who savor the richness and acidic flavors associated with dark chocolate, this is most likely an excellent wine. 2007 Quinta Do Castro Douro Red – The instant I place my nose to this wine I was reminded of my grandmother’s kitchen. Having come from southern France, she kept as much of her homeland with her in her food and surroundings, the perfume of this wine had that same floral French flavor to it. The taste, however, left me with more of a sturdy oak impression. With the second tasting a bit more of the floral flavors returned, but not enough to move this from the middle of the wine samplings. All of these wines are available for under twenty dollars a bottle, some are actually under ten dollars, but as stated above, they are difficult to procure. The point of the Gary's tasting exercise, however, is that so many of us get locked in to a certain varietal or type of wine, however, there are so many flavors, and textures, and grapes that we haven’t even begun to sample. The benefit of having this tasting in Epcot’s World Showcase is that there is a world of wine surrounding you that is within walking distance. So, the next time you are in World Showcase step away from the cabernet, merlot, and pinot and try the Wine Walk (which we will discuss in an upcoming article) or ask the sommelier what they recommend. The Swiss Family Treehouse, found in the Magic Kingdom’s Adventureland, may be a walk through attraction, but the stories told within this tree are extraordinary. The Treehouse is the first attraction guests encounter on their journey through Adventureland, and is frequently overlooked in favor of the Jungle Cruise or, more often, Pirates of the Caribbean. The home of the Robinsons, this treetop bungalow is a representation of the home constructed on an island in the 1960 Disney film, Swiss Family Robinson. Throughout the boughs and branches, guests can see what island life in a tree could resemble as they make their way through bedrooms, a kitchen, study, and living area. Glimpses into the era, and handcrafted tools, can also be seen in the water ferrying system, the organ, even the barrel of brandy! On the engineering side of things, Disney had to create a tree that could at once appear as lifelike as a real tree and still maintain the supports needed to house such structures and the guests traveling through them. The Imagineers decided to work with the idea that they tree they were creating was a banyan tree, a that has far reaching roots and happens to be native to Florida. The sixty feet tall, ninety feet wide Swiss Family Treehouse has over three-hundred thousand fabricated leaves and roots that burrow forty-two feet into the earth. Of course, since the tree is manmade, the species couldn’t be listed as a banyan tree. So, the Imagineers dubbed the tree Disneyodendron eximus, otherwise known as Out-of-the-Ordinary Disney Tree. Let’s go ahead and traverse the 116 steps the comprise the Swiss Family Treehouse, and see just what the Robinsons lived through and with. As well as taking in some of the breathtaking views of the Magic Kingdom that the tree has to offer. Concept art is a tool used to visualize an area or attraction before the ground has even been broken. Within the process of creation, there is no better instrument to assist in envisioning the dream and seeing it through to completion. For Walt Disney World, there is no question in my mind that EPCOT Center had the most detailed, far-ranging, and largest set of concept art for any park at its opening. Depending on when you saw the concept art, or for today’s collectors and admirers, what period you are looking at, EPCOT Center could have been a vastly different place. The Living Seas could have been in a much more angular pavilion and stashed across the park in Future World East. Almost all full park paintings included the much discussed African Pavilion in World Showcase. The possibilities were limitless, but the fine-tuning that was done over the years between dreaming the concept and building the prototype community led to an incredibly rich world in which to learn and play. 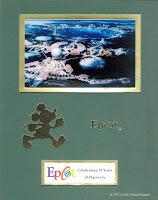 As part of the park’s celebration of its fifteen years of edutainment, during 1997 and 1998, Epcot made a cornucopia of exclusive celebration merchandise. As always, some of this merchandise was only available to Cast Members. Among these various Cast Member exclusives were a set of four commemorative photographs that numbered on 1,500 each. In all honesty, these were actually postcard-sized reproductions of concept art, matted with each pieces title, and mounted with a kickstand to hold them up. Each separate piece came in its own envelope and were completed with a description adhered to the back. Let’s see what four pieces Epcot chose from its vast collection to represent its history and celebrate fifteen years of Discovery, and how Epcot saw each piece fifteen years on. The American Adventure (1 of 4) – Housed in a classic Georgian-style brick building, The American Adventure brings to life the history of the United State through a complex combination of Audio-Animatronics, multimedia and elaborate sets. Spaceship Earth (2 of 4) – Rising 180 feet high, Spaceship earth stands as a monument to human understanding. Inside the geodesic sphere is an attraction tracing the history of communication. World Showcase (3 of 4) – World Showcase brings together an international community to promote a sense of fellowship and understanding through attractions, exhibits, entertainment and personal interaction. Epcot (4 of 4) – A world of discovery surrounds Guests at Epcot, a showplace for technological innovation, environmental awareness, the mysteries of the mind and body, and the diversity of humanity. Today’s Back Issue is brief, but it says a lot about the type of mind that is attracted to the work of Imagineering. In fact, while there is a paragraph to explain the graphic, the actual article is all about the drawing presented. Where’s the Restroom? comes from the Winter 1990 issue of WD Eye, and is the work of John Drury. Drury worked at Imagineering for over twenty-five years, during which time he worked on projects for the Magic Kingdom, EPCOT Center, Tokyo Disneyland, Disney-MGM Studios, as well as Walt Disney World as a whole, including the art direction for the World of Disney store. I could talk about this single piece of art for hours, but I think it speaks better for itself. At the opening of Tokyo Disneyland in 1983, a group of visiting Disney executives expressed concern over operational signs and directional graphics. 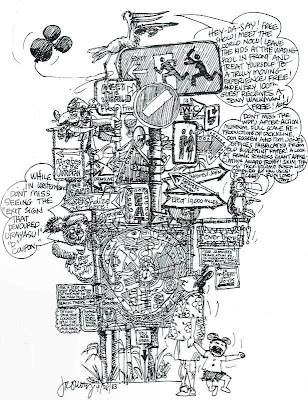 Solution-oriented John Drury, now at WDI Florida, arrived at this concept development drawing of an all-encompassing “you are here” TDL directional. Luxo Jr. first came on the scene as the title character in a 1986 Pixar short. The short, which would go on the receive an Academy Award for Best Animated Short Film, would be the first stop of an illustrious career that would soon turn the lamp into Pixar’s mascot. Today, Luxo Jr. entertains audiences at Disney’s Hollywood Studios. Found in Pixar Place, the lamp regularly comes out from its workspace to perform dance steps to various styles of music. In the evening, Luxo Jr. still dances, but he is also accompanied by a light show. Perhaps one of the more intriguing aspects of Luxo Jr.’s placement is that fact that he is located above the Lighting Department’s door. When the area first opened in May of 2008, a lamp cord could be seen spelling out the word ‘Luxo’ above the word ‘Lighting,’ with the Luxo Ball being wrapped up in the cord with the word ‘Jr’ printed on it. This was clearly alluding to the dancing Luxo Jr. that would debut in 2009. However, with the lawsuit filed against Pixar by the Luxo lamp company, a lawsuit which has reached an “amicable settlement,” the name was removed from the sign. Whatever the case of the name, or the rights to present the name, the bouncing, dancing lamp is forever linked to Pixar and has a special place in many of our hearts. Oh, and in case you’re wondering what type of bulb Luxo Jr. uses, according the the bulb currently seen in the dancing lamp at Disney’s Hollywood Studios, it is a Pixar Animation Studios 1986 40 watt bulb. Almost twelve-hundred articles and a little over two years ago I started this journey I curiously dubbed the Main Street Gazette. 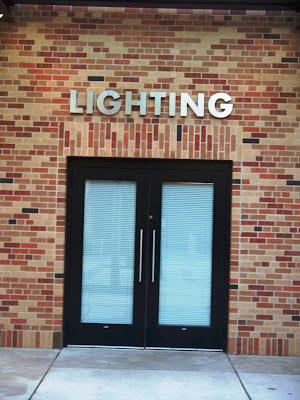 It was an outlet, a place for me to share my thoughts, insights, and perspectives on Walt Disney World. I thought I had a wealth of information to share, and then I felt the pangs of reality settle in, it was going to take a lot of work to keep this hobby going and I didn’t have nearly as much education into the wonderful world of Walt Disney World as I had thought. So, I began my own education. In a little time what I had started as a hobby, and as a way to stop pestering my wife (then fiancée) with mind-numbing lists of facts and figures, brought me more joy, thanks to all of you, and ideas than I thought I could hold or create. I pumped out more and more articles and crafted an ever-growing list of projects for myself behind the scenes. I have had the opportunity to work with some of the greatest minds in the field of Walt Disney World that do not work for Disney on podcasts and in Celebrations Magazine and through a number of other venues, but each and every day I return back to this small publication I started. What started out as a hobby has grown into a dream that I couldn’t have dared imagine a few short years ago. I have reached a point where I need to begin some solid work on projects, projects I hope to be able to discuss in more detail with you all soon, but the Main Street Gazette requires so much of my time. So, sadly, as of January 1st the Main Street Gazette will be cutting back to a weekday only distribution. But that is the only piece of slightly depressing news I have for you today. On the other side of that coin, I am happy to announce that I am going to be shifting away from a blog format to a more substantial design. While there will still be articles on the front page each day, the Gazette will, over time, begin to create a resource to chronicle the multitude of details from around Walt Disney World that I love to talk about so much. While all of this will not be completed, or ready to launch, tomorrow or next week, it will be coming soon and will continually be a work in progress. The design is in the more than capable hands of our good friend Eric Hoffman, who seems to succeed even in the face of my bumbling things up. PERSPECTIVE (Mondays) – Personal reflection on a Disney topic. Thoughts on art, shopping, underexplored areas, changes, anything that sparks the imagination. This will also include the occasional roundtable discussion. 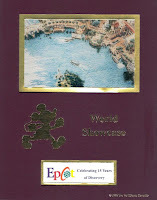 THE WED PAGE (Tuesdays) – The history of Walt Disney World. 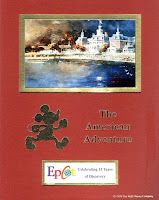 The stories, lighthearted and/or documented accounts, covering the past forty years of Walt Disney World. DISNEY DELISH (Wednesdays) – Restaurant reviews, the design of dining establishments, home cooked Walt Disney World recipes, if it has to do with food and Disney, you’ll find it here. PHOTO SAFARI (Thursdays) – A photo article detailing the highlights of a specific area or a mass quantity of photographs pertaining to a specific topic. THE WDW RECORD (Fridays) – The detail resource the Main Street Gazette is going to be creating will take time to develop. This section will highlight a single entry once a week. So, there you have it, the new plan for the Main Street Gazette. Wait… it feels like I am leaving something out… New design, check... New schedule, check... New content, check... Oh, I know! Some of you may have taken a second glance when you saw the words The WED Page as a weekly section. Starting in January, Tony Caggiano is going to start writing for the Main Street Gazette twice a week. For those of you who know Tony and have read his work, you know his passion for the history of Walt Disney World rivals my own. He will bring his brand of storytelling, humor, and deep-rooted love of Disney to the Gazette, and I cannot wait for all of you to see what he has in store! I hope you will all welcome him with warm hearts and open arms. The new Main Street Gazette will carry with it the same heart as its previous incarnation, but without all the clutter. I hope it will be a resource to all who want to learn about the happy place that is Walt Disney World, and I hope it will bring more Disney to your daily life than ever before. On day one, over two years ago, I said I had blathered on quite a bit, but that I hoped you would come back, and you have resoundingly. For that, I am humbled and I can never thank you enough. I only hope that you’ll continue to want to read what I, and Tony, have to say. For today, however, I hope you find warmth with the loved ones you are with and the magic of the season in your hearts. Merry Christmas, or Happy Friday, to one and all! It has been a while since we took a few moments, sat down around the table, and batted around some personal thoughts about Walt Disney World. Of course, being the holidays, it is rather difficult to gather such a large and busy group. Those that were able to make it have some great, warm thoughts to share with the Main Street Gazette readers and the rest of the table, who are here in spirit, echo much of the other pundits’ sentiment, I’m certain. Being that it the time of many winter holidays, I thought it would be a fitting end to this year’s edition of the Gazette Roundtable to talk about what we are thankful for, within the realm of Walt Disney World, of course. Feel free to chime in with your own thoughts, and what you would like to see over the course of next year’s roundtable. Roundtable Topic: What one thing are you thankful for at Walt Disney World, and why? Roundtable Guests: Fiona Doyle (DF’82), Tony Caggiano (The W.E.D. Page),Lori Burke (We Wants the Redhead), Chris Fore (Yet Another Disney Blog), and myself. Fiona – There are so many things that I am thankful for at Walt Disney World, it is hard to narrow it down to one. So many attractions, parades, fireworks, experiences all make me thankful for the parks' existence! That being said, I think that, for me, the one 'thing' I am thankful for at Walt Disney World isn't a ride or a tangible place. It is the fact that I can go to Walt Disney World with my entire family. Going back to one of Walt's quotes on Disneyland, "We believed in our idea - a family park where parents and children could have fun - together". I think this is the one thing I am thankful for. I have had many holidays at Walt Disney World with my family, that it holds so many memories and enjoyable experiences for us all. It is a place where we can all feel young again, and where we can go on Dumbo without feeling silly, or queue for (what feels like) hours just to fly over London with Peter Pan...no matter how old we are, or who we are with. It could be said that there are many other 'theme parks' where parents and children can ride together, but no one does it in such a way like Disney. I have been to several 'other' theme parks with my family, and nowhere did we all get to enjoy the same experiences better than Walt Disney World (and the other Disney parks). And it is because of Walt's original idea that I have so many great memories of times with my parents where we all got to experience the same, youthful feeling! Chris – I'm thankful that the Powers That Be have continued their recent history of refurbishing/refreshing classic attractions at Walt Disney World. Pirates of the Caribbean was an obvious choice, but to follow that up with the Haunted Mansion, Bear Band, Spaceship Earth, and Space Mountain continues to put a smile on my face. The thing that really drives this home for me is that these updates were done in a way that respects the original experience. It's obvious that these projects were done by people who love these attractions as much as the rest of us, and have given us all new chances to "relive fond memories of the past" while also letting us "savor the challenge and promise of the future". Lori – I am thankful to Walt Disney World for all the friends it has given me. I know that sounds funny but if I didn't have this great love of Disney I wouldn't have met so many wonderful people. Many of my closest friends I've met at either WDW or at Disney events. When you meet someone at a Disney park or event you automatically bond with each other. Some of the friends I've only known for a short amount of time, but yet, I feel like I've known them my whole life. We talk every day whether it's on Facebook, email, text message or the phone. I think I talk to my Disney friends more than my friends that I've known for 20 years. There is just something about WDW that brings people closer together. We tend to extend a helping hand out to one another even though we've only known them for a short amount of time. And some people you only see once a year or less but when you do see them again it's like you just saw them yesterday. So during this holiday season I just want to tell all my "Disney" friends, thank you! Thank you for making my life more than special than it ever was before. I love you guys!! Tony – The thing that I am most thankful for at Walt Disney World during the holidays would have to be the atmosphere. I am sure that many will call this a "cop out", because I suppose that I am not actually choosing any single "item", but there is no other way to describe what I love so much about this season. Decorations abound, the air is filled with the music of the holidays and cast members (while always friendly and courtious) are exceedingly so during the holidays, even under the added stress of crowds and extended working hours. In my opinion, there is no better time to be in The World. Spending the hoildays in Walt DIsney World with my family has always been, and will always be, a very special experience. I find that during this time of year we spend far less time riding attractions and more time enjoying each other's company in the festive surroundings. One of our favorite activities this time of year is "Resort Hopping"...and it is something we have taken to a whole new level. While during a typical vacation we will visit many of the resorts, either after a morning at a park or perhaps to grab a meal before an evening of attractions and fireworks, during the holidays we spend entire days strolling the grounds of different resorts. Many resorts have special hoilday offering which make them a destination unto themselves. Slowing down, looking around, breathing it all in (especially the smell of Gingerbread)...that is what I am most thankful for this time of year in The World. Ryan – There are hewn-logs split to make authentic fences, there are fireworks that put tears in my eyes, and there are rides that make my heart flutter no matter how many times I approach them. But the one thing that makes my experiences so magical are the people. Cast Members work tirelessly, often times for a wage below their potential, at creating special memories for each and every guest that crosses their path. Even correcting a child who has crossed over a wall can be left with a warm feeling, not realizing that they have been corrected. From sweeping the streets and keeping them safe, to feeding and entertaining the masses, the Cast Members are where the memories and magic begins and ends. 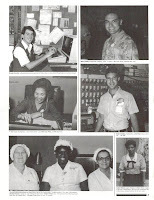 However, the Cast Members aren’t the only people who make Walt Disney World so special. There are family and friends that mean more than any Fastpass. As a friend of my has said, and I am fond of quoting, it is never a ride or fireworks show that I remember the most, often times it is sitting down to a good meal with wonderful friends. The company you keep, and the friends you make, in Walt Disney World makes all the difference. I hope each and every one of you find something special, both in and outside of Walt Disney World, to celebrate this season! When it comes to the best place for a hearty, sit-down breakfast on Walt Disney World property, there are always several contenders. The most common culprits are the Crystal Palace in the Magic Kingdom and various stops along the Magic Kingdom’s Resort Monorail loop, including Chef Mickey’s and ‘Ohana. ‘Ohana’s smaller cousin, Kona Cafe, is talked about in Disney circles but is often times overlooked unless ‘Ohana is full. For the serious breakfast enthusiasts, that is a mistake. When it comes to breakfast, I know that I am the exception to the rule, as I do not do coffee. My wife, however, could have the stuff delivered intravenously and still need a cup of fresh brewed coffee in her hand. At Kona Cafe, your basic coffee comes in two forms, a Kona Blend or 100% Kona Coffee. The blend is perfectly fine, but the 100%, served in a French press pot, is heaven in a cup. According to the menu, after the coffee beans have grown in one of the most fertile soils on earth, “These beans are then flown to Central Florida, where they are roasted to our strict specifications. We then grind the beans to order.” This may seem like the liquid gold of the coffee world, and one would expect a steeper price, but a French press pot for two only runs $7.49. Kona’s coffee gets high marks in flavor and body, as well as quality control. For the non-coffee crowd, Kona Cafe offers a variety of juices, alcoholic cocktails, and specialty drinks. The juice selection is more than your usual orange or apple, and includes such diverse offerings as grapefruit, cranberry, tomato, and pineapple. In the cocktail department you have the classic Mimosa and Kona’s take on the Bloody Mary, the Wasabi Mary, which is a concoction of Absolut Peppar Vodka, wasabi, tomato juice, and various spices. There is also a Mega-Berry Smoothie, with an emphasis on raspberries, and my personal favorite, Lilikoi Juice, a tropical fruit mixture of orange, guava, and passion fruit juices. The Kona Cafe breakfast menu offers something for every eater, and covers both sides of the sweet or savory breakfast debate. Fans of traditional breakfasts can choose from a fruit plate served with banana-nut bread, to pancakes (with or without blueberries), French toast, ham and cheese omelets, steak and eggs, or just two eggs. For the adventurous breakfast diner, there are options that include macadamia nut butter, poached eggs served with hollandaise over smoked pulled-pork hash, and, of course pineapple. My wife will often times explore a different entrée each time she eats at a restaurant. At the Kona Cafe, however, she has been hooked on the Macadamia-Pineapple Pancakes since the first bite. In fact, her love affair with these pancakes, which comes with macadamia nut butter, pineapple sauce, and a choice of meats, has become so serious that as she waits for her meal now she does a jig in her chair and sings a little song that goes something like, “I. Love. Macadamia-Pineapple Pancakes. I love them, yes I do.” For my part, I am as large a fan of the headliner at Kona Cafe, the Tonga Toast. Although I don’t take my passion for this banana-stuffed, cinnamon-sugar encased, sourdough French toast to the level of singing a song about it, just a thought about smothering this already sweet to the point of pucker-worthiness with a dollop of strawberry compote is enough to make my mouth water. This massive meal clearly has a grandmother-who-thought-her-grandson-needed-to-be fattened-up’s fingerprints all over it, and has been a favorite of Polynesian Resort guests for over twenty-five years. A note about the meat choices, which include ham, bacon, or sausage, that are available with most meals. The sausages are in link form, but rise far above the average sausage link in terms of size and zest. Also, a majority of entrées come with a wedge of pineapple. This piece of fruit should be saved as the last bite of a meal, as it is the perfect palate cleanser. Any way you slice it, Kona Cafe offers a wonderful assortment of breakfast dishes, for a fair rate, in a unique, but oddly down to earth, pacific island environment. While the restaurant may lack the character interactions that make so many breakfasts the hottest meals in town, Kona Cafe’s fare has a character all its own, and is a true treasure of the breakfast circuit.